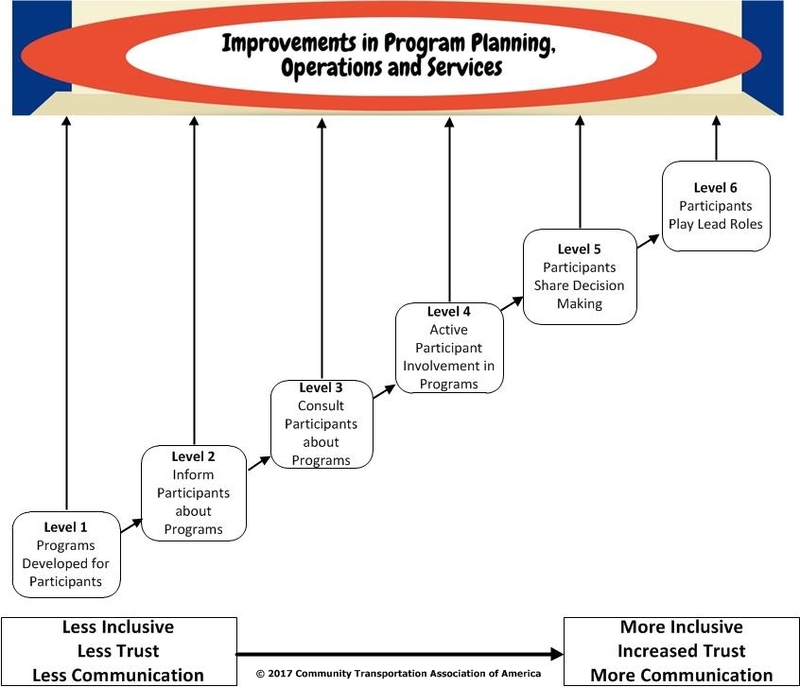 The Inclusive Transportation Planning Project: An Update (PDF) – Project Officer Eric Weakly's presentation at the 2015 Home Community Based Services conference sponsored by the National Association of States United for Aging and Disabilities. 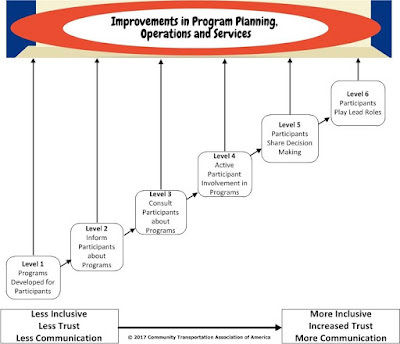 Conversations on Inclusive Planning (PDF) – The Strengthening Inclusive Coordinated Transportation Partnerships to Promote Community Living Project, begun in 2013, seeks to demonstrate the value that inclusive processes can bring to transportation efforts. The seven grantee project teams met on May 29, 2014. A Braille version of the infographic is available. 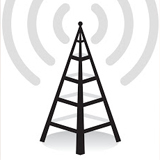 Send an email request to TransitPlanning4All@ctaa.org. 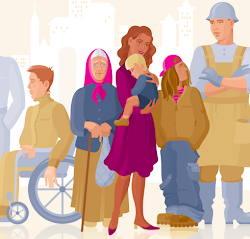 Disability Etiquette - Tips for Interacting with People with Disabilities, Fact Sheet #17, prepared by the National Disability Navigator Resource Collaborative – This short guide is a useful introduction to newcomers and to experienced staff. It presents basic information for communicating effectively with all people with information, and specific information for communicating with persons with specific disabilities, e.g., people who are blind or have low vision, people with cognitive or intellectual disabilities. Tip-Sheet: Planning Inclusive Meetings, Going Beyond the ADA to Make Your Meeting Place User-Friendly (PDF)(159 KB) – A short list of features that although they do not rise to the level of ADA-violations, can discourage people from attending meetings. The brief list encourages thinking about the details of planning an inclusive meeting; and a checklist for seeking out meeting locations. Tip-Sheet: Friendly Meetings for English Language Learners (PDF)(267KB) – The main ideas for planning general community meetings also apply to meetings for a target audience. The information in this tip-sheet can be your foundation as you plan on how to include persons who are learning to speak English. Engaging People with Respectful Outreach, Language, and Individual Attention - Webinar from Transit Planning 4 All that addressed engaging hard-to-reach populations, the sensitivities of terms used to refer to people with disabilities, and replacing the term "limited English proficiency." More information is available on our webinar page. TCRP's Research and Results Digest 107, April 2013: Developing Partnerships for Transportation Agencies and the Disability and Underserved Communities – (PDF) This publication includes strategies and suggestions that transit providers can use to develop and sustain partnerships with customers with disabilities and representatives that advocate on their behalf. How to Engage Low-Literacy and Limited-English-Proficiency Populations in Transportation Decisionmaking – Prepared by PBS&J for the Federal Highway Administration, February 2006. This outstanding and well-organized publication is filled with wise guidance on special approaches need for effective outreach most of which is generally applicable and can be adapted for community outreach efforts to other populations. One of their recommendations for outreach is "Seek out the Elders." Includes references to other resources. Transit Cooperative Research Program (TCRP) Report 150: Communication with Vulnerable Populations: A Transportation and Emergency Management Toolkit (PDF) – This toolkit describes how to create a communication process to reach vulnerable populations regarding their transportation options. Much of its information is applicable to reaching vulnerable populations in non-emergency situations. Public Participation Plan, Southwest Michigan Planning Commission (2017) – This a well-organized and reader-friendly document. The text is addressed to public bodies, but it contains generally useful information, including a brief subsection on tribal outreach. There are good tips throughout that may seem obvious, but that often get overlooked, and tables that break down issues to consider into small components. Transportation Planning Capacity Building – The Federal Highway Administration offers a compendium of links to state studies, reports, training courses, and a calendar of events and webinars. Best-of-the-Best Resources for Understanding Dialogue, Deliberation, and Public Engagement – The Resource Center of the National Coalition for Dialogue and Deliberation has prepared a list of Best Tools for Understanding Dialogue and Deliberation, Best How-To Guides and Manuals, Best Tools for Facilitators, Best Articles. Participatory Approaches to Planning Community Interventions - This brief discussion provides valuable insights. It is only a brief section of a massive onsite Community Toolkit on the website of the Work Group for Community Health and Development at the University of Kansas. "The Community Tool Box is a global resource for free information on essential skills for building healthy communities. It offers more than 7,000 pages of practical guidance in creating change and improvement." Resource Guide on Public Engagement – NCDD's October 2010 Resource Guide on Public Engagement showcases the National Coalition for Dialogue Deliberation's best collaboratively-created products (like the Core Principles for Public Engagement and the Engagement Streams Framework), as well as recognizing and directing the reader to other work on public engagement that has been done by others in the field. It contains a directory of valuable resources, points of contact, and case studies of successful collaborations. TRB's National Cooperative Highway Research Program (NCHRP) Report 710: Practical Approaches for Involving Traditionally Underserved Populations in Transportation Decisionmaking (2012) (PDF) – "This Report builds on the earlier reports, How to Engage Low-Literacy and Limited-English-Proficiency Populations in Transportation Decision-making and Transportation and Environmental Justice: Case Studies, published by FHWA. It updates and captures new and innovative tools, techniques and approaches being used within the transportation industry and other industries. It contains a compendium of practical and easy-to-use best practices that practitioners can use to identify and connect with traditionally underserved populations, particularly minority, low-income, limited English proficiency, and low-literacy groups, in transportation decision-making. There is no "one size fits-all" strategy but rather a continuum of approaches that can be taken or customized to reach different communities or that are particularly appropriate for a specific stage of transportation decision-making." Transit Cooperative Research Program (TCRP) Synthesis 89: Public Participation Strategies for Transit (PDF) – "The goal of this synthesis is to provide transportation agencies and public involvement practitioners with ideas and insights into the practices and techniques that agencies around the country have found to be successful, as well as to explore some of the challenges they have faced. The study documents the state of the practice in terms of public participation strategies to inform and engage the public for transit-related activities to provide ideas and insights into practices and techniques that agencies have found to be most successful, as well as to explore challenges faced. Specific techniques and the methods by which transit agencies execute public involvement strategies are seen as constantly evolving and bounded only by the creativity of practitioners. Includes 6 transit case studies." Transit Cooperative Research Program (TCRP) Synthesis 85: Effective Use of Citizen Advisory Committees for Transit Planning Operations (PDF) – "This synthesis is focused on the operations and management of advisory committees rather than on substantive outcomes. It includes a review of the relevant literature, information gathered from a survey of transit agencies and MPOs, and case studies that highlight successful practices. The literature review, agency and MPO survey, and case studies reference ad hoc committees formed to provide short-term input on specific projects, programs, or policies on a limited basis, as well as standing committees that provide long-term input on day-today operations or specific issues." Transportation Planning Capacity Building's Public Involvement Techniques: Reference Guide – This is a reference work that includes the 14 techniques originally published in Innovations in Public Involvement for Transportation Planning in a wide variety of public involvement techniques available to transportation agencies. There are four chapters with subsections that group techniques thematically by function. Each chapter ends with a final subsection called "Taking Initial Steps." Public Involvement Plan and Toolkit for Las Cruces - U.S.Environmental Protection Agency with the U.S. Department of Transportation and U.S. Department of Housing and Urban Development. "Though written specifically for city of Las Cruces staff and decision-makers, the strategies and tools compiled in this document will be useful for many other communities wishing to expand the conversations about development to include populations that have often remained outside of decision-making process because of socioeconomic issues and language barriers. A more inclusive decision-making process can help communities identify and decide upon policies that encourage development that is good for the environment, the economy, public health, and the community. Toolkit section includes a series of outreach and participation tools." Public Engagement Report, Metro Transit, King County, 2012 (PDF) Faced with the need to implement a plan that eliminated a popular longstanding program that provided essential transit service to many low-income residents, King County developed a strong public outreach effort to explain the situation to the community. This is King County Metro Transit's Report on this outreach effort and its results. Every Ride Counts, from the National Aging and Disability Transportation Center (NADTC), offers an easy, usable public relations campaign template with posters, postcards, social media posts and graphics, and advertisements. While the materials, do not magically produce transportation where it is needed, they do assist in solving the problem of alerting individuals to transit and transportation services that do exist. MyMobility Plan makes available a practical checklist for older adults or anyone who might be giving up driving or transitioning to living with a disability. The plan is customizable for organizations to insert their names and contact information. It asks individuals about transportation options beyond driving and similarly addresses other issues that affect continued independence, including exercise and safety in the home. MyMobility Plan is a product of the Centers for Disease Control and Prevention (CDC).